What a lovely themeless crossword this is. A couple 14s, an unusual length, bracketing the wide-open middle. Smooth fill. And starting off at 1a with an irregular verb whose past tense doesn’t end with -ED is mildly tricky and welcome ([Knew going in], FORESAW). Plenty of good fill—the only thing I’d ding it for is the UP doubling in SWELL UP and TONES UP. Favorite words: CHUMP and BARMY and “OOF” all have a flavor I like. FINAL EXAM‘s solid. “What’s ON THE MENU?” (16a. [Coming up, informally].) Could be a bucket of KFC on the BEACH, or drinks and dancing. AFRIKANER clued by way of Charlize Theron (Fiend blogger Gareth is of English rather than Afrikaner descent, I believe). Hawthorne’s TWICE-TOLD TALES bring the literary vibe. “YES, MA’AM” is solid. POOR SPORT, FEDEXES, WETSUIT, SACK OUT, W.C. HANDY, UKULELE (instead of the godforsaken disproportionally-used-in-crosswords shortened UKE), LANCOME, CYNDI Lauper. 24a. [Onetime competitor of Mad magazine], SICK. I have never heard of this, only Cracked. Trivia! 54a. [It “has very quick ears to an accusation,” per Henry Fielding], GUILT. I didn’t do it. 10d. [It’s played close to the chest], UKULELE. “Play it close to the vest” is a phrase, right? 43d. [Full of oaths], SALTY. That’s your old-school salty language. Salty has other senses besides cussing and salinity. Ben Zimmer wrote about the old black slang term salty—meaning “exceptionally bitter, angry, or upset”—that’s picked up traction of late. Crosswords with clunky fill kinda make me salty. A topical theme. 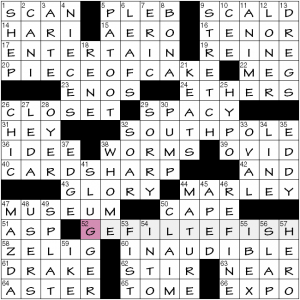 52-across explains: [Stuffed Passover staple … and a hint to what 20, 32, and 40 Across have in common] GEFILTE FISH. Gefilte, as you may have already known—or have learned recently—is Yiddish for the attributive verb stuffed, akin to the German Gefüllter. 20a. [Cinch] PIECE OF CAKE. Pike is ‘stuffed’ with other letters, a mish-mash on their own. 32a. [Roald Amundsen was the first explorer to reach it] SOUTH POLE (sole). He had the longest arms. 40a. [One with an ace up his sleeve?] CARDSHARP (carp). CARP and PIKE are among the most traditional fishes in recipes, so it’s smart and conscientious to use them here. 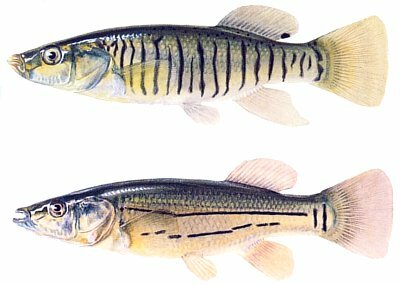 Wikipedia tells me that other popular varieties include perch, mullet, whitefish, and salmon. SOLE is not mentioned, which doesn’t necessarily mean it doesn’t exist in this form (which is different from the stuffed sole one is likely to see on menus). 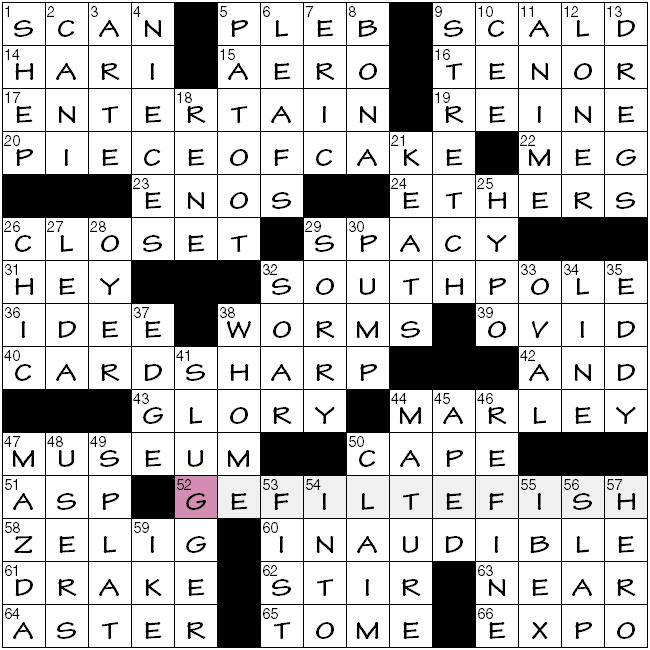 However, I have a (small, thin, translucent) bone to pick with the puzzle’s title, as the bulk of the fish varieties mentioned (with, among others, the notable exception of sole) are freshwater species. Besides, I couldn’t help but think of conchiglia and ricotta. Also? No-one wants to see WORMS dead center in a grid about stuffed fish for eating – 38a [Some malware]. I suppose the nearby 43a [“No guts, no __”] GLORY is passable. 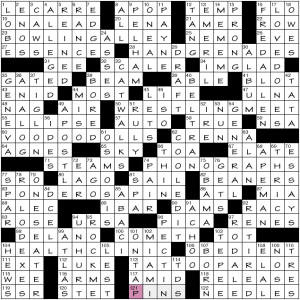 Only four theme answers (including the revealer), yet there’s a relative dearth of mid-length fill. As a result, the contents of the grid feel chopped-up, yet somehow homogeneous. Perhaps this was intentional. 44a [Scrooge’s business partner] MARLEY; 50a [Promontory] CAPE. New knowledge: 47a [Automaker named for a god of wisdom] MAZDA. From the Zoroastrian Ahura Mazda. Though there’s a main entry for it, Wikipedeans in their finite wisdom have omitted the deity from the page listing such entities. They should correct that, stat. Thus speaketh I. 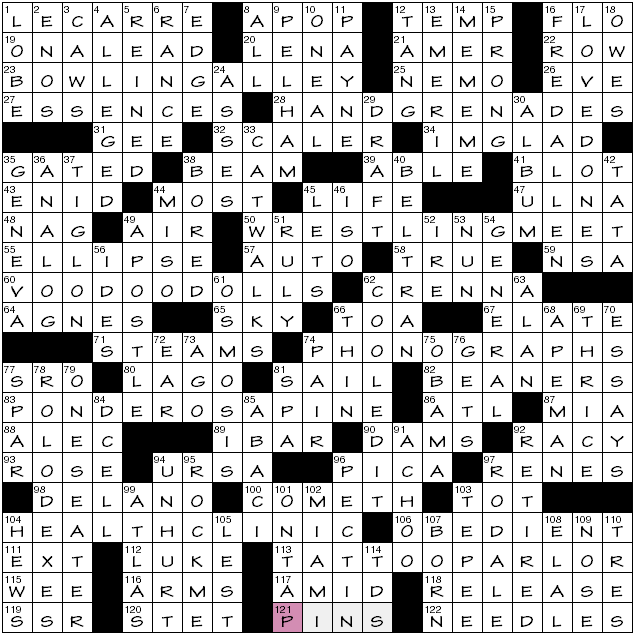 Favorite clues: 22a [Part of a gig] MEG; 56d [Response to a fresh overture] SLAP; 25d [Thesis beginning] HYPO-; the one-two of 29a [In la-la land] SPACY and 31a [“I’m talking to you!”] HEY. 37d [One of 12 in a cube] EDGE. Not “on”? 29d, in the center: [“My bad”] SORRY. Yom Kippur is the Jewish holiday of atonement, so that doesn’t augment the theme. Ah well. Happy Friday, everybody! My word, we’re finally having some springlike weather here on the East Coast! I almost don’t believe it. 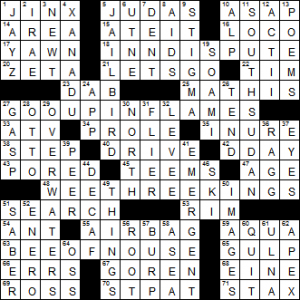 Mr. Randall J. Hartman provides us with today’s crossword, and the four theme answers are multiple-word entries in which the second word is also the noun form of a verb which pertains to ways people get around on foot. BABY JOGGER (48A: [Big name in strollers]) – It’s so popular that even I’ve heard of it, and I live under a rock more than a few months out of the year! ROAD RUNNER (65A: [Wile E. Coyote’s nemesis]) – And a cute nemesis at that, huh?! Thanks to Randall for making me have some good memories right now as I just reminisced of watching D.C. CAB as a kid (29D: [1983 comedy with Mr. T]). Honestly, I haven’t seen that movie since I was about seven or eight years old. Interesting to see both ELBA (3D: [Island off Tuscany]) and MELBA in the grid (15A: [Peach _____]). The two long down answers are sweet fill, even if one of them is a NASTY HABIT (30D: [Chewing tobacco, for one]). The other long answer, CHAPEL HILL, I used to misspell as a kid because I put in two Ls at the end of Chapel, thinking the endings to both words were the same (10D: [Home of the Tar Heels]). 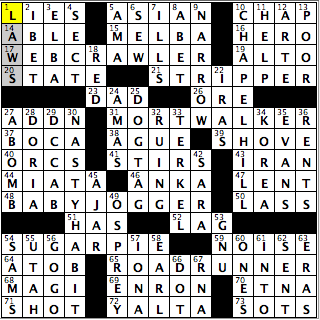 Not sure how popular MIATAs are out on the roadways, but the vehicle has been pretty popular recently in crosswords (44A: [Mazda model]). Oh, and definitely love the trivia aspect to KOREA, and that’s something I didn’t know at all before doing completing the grid (34D: [Country once called the Hermit Kingdom]). Good to know! “Sports will make you smarter” moment of the day: ARTE (12D: [“Laugh-In” comedian Johnson]) – I’m actually not sure if I’ve blogged about him before, but Arturo “ARTE” Moreno is the current owner of the Los Angeles Angels of Anaheim of Orange County of the state of California of the United States of the planet Earth. (OK, it’s just the Los Angeles Angels of Anaheim.) The Vietnam veteran and former advertising company head bought the Angels from Disney in 2003, making him the first Mexican-American owner in major professional American sports. Thank you for your time, and I’ll see you tomorrow! Have a good weekend! In case you’re searching for the explanation of this puzzle’s theme, look no further than the final two across answers. 121a [Feature of the members of Group 1] PINS, 122a [Feature of the members of Group 2] NEEDLES. 23a. [Member of Group 1] BOWLING ALLEY. 28a. [ … Group 1] HAND GRENADES. Four in each group, and each group restricted to one half of the grid. I dig the formality. Many shared crossings between ‘pairs’ of themers, also spiffy. And to tie things off neatly, One-across slyly references the theme and title: [“The Tailor of Panama” author] LE CARRÉ. 1d/72d/109d [Ring setting] LOBE, EAR, NOSE; 110d [Uno + dos] TRES, 69d [Number of times “the brinded cat hath mewed”] [sic] THRICE. It’s like a circus here. Oh, and Macbeth might be in the offing again later in this post. 68d [Transitional feature] APEMAN. >cough< My opinion about this is firmly in the (non-fossil) record. Commenter Margaret knows what I’m talking about. On to hybridization: 37d TIGLON is a new version to me, as I was only cognizant of the tigon spelling. See also liger. It’s my understanding that these hybrids are artificial, though it’s plausible that in the past they occurred in nature, as the historic distributions of both tigers and lions were more extensive and overlapping. Nowadays there’s just a relict population of Asiatic lions (Panthera leo persica) in western India. Note also the clue’s duplication avoidance with 33d CATWALKS. More multi-use clues: 57a/96d [Jam ingredient] AUTO, PECTIN; 51d/106a [Well-behaved] RULY, OBEDIENT; 38a/89a [Construction piece] BEAM, I-BAR. 55a [Satellite’s trace]. With the initial E in place, my thoughts were conflated with contrails and I tried to fill in ENTRAILS. Ha, ha? ELLIPSE. Kind of a strange clue, anyway. An elliptical one? Speaking of which, 100a [Verb in an O’Neill title] COMETH; anybody else chronically think of comets and ice-balls? Another minor mis-fill: 46d [Prefix with thermal or metric] EXO- prior to the correct ISO-. Favorite clues: 74d [It might be held by a folder] PAIR; 44a [Record label] MOST; 29d [Curtain mover] DRAFT. By the paraesthesia in my pollices, two pricking thumbs up. Nothing wicked on the horizon. It is generally a problematic design to have corners with only one entry and exit, as in the 4x4s in the top-left and bottom-right. They’re easy to fill adequately, so what does one do with them? Here Mr. Quinlan opts for the Scrabble-licious route. The top-left works best as the answers; JAYZ, JINX and XANADU are zippy. The bottom-right has more prosaic Q/X letter answers; both have only minimal casualties in pursuit of these letters. SOUTHSUDAN is an au courant answer and JAILBIRD adds some more high-value action. My favourite clue was [Drowns in the garden] for OVERWATERS – the violent overtones! Least familiar answer – [Woolen yarn], RAGG. This entry was posted in Daily Puzzles and tagged Damien Peterson, George Barany, Jim Quinlan, Marcia J. Brott, Patrick Berry, Randall J. Hartman. Bookmark the permalink. Lovely is the word I wanted to use for this Patrick Berry puzzle, and you said it. I am happy to concur. Superb puzzle. I knew the gun manufacturer, but did not realize how to spell it. I liked POOR SPORT a lot, but was not as crazy about FORESAW. I think of it as anticipating, not knowing, but I recognize that is cavilling at its worst. Blame Robert Blake and Stephen J Cannell. 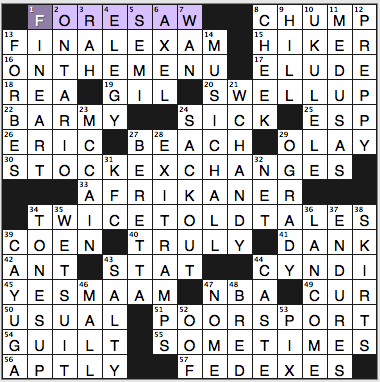 Nice puzzle indeed … but am I getting better at this or have the end of week puzzles been kind of easy lately? My only hiccup here was AFRIKAANS before AFRIKANER, everything else went in very smoothly. It helped that MUSICHALL and BARMY were gimmes for me. Can someone explain the clue for 6d Impressive way to turn up? An AXEL jump in figure skating is an aerial pirouette. Pannonica, thank you for parsing the CHE. I certainly couldn’t find the theme though I enjoyed solving the puzzle nevertheless. I am not a theme lover anyway. pannonica: Cute write-up. I noticed the fresh water aspect, as well, but didn’t associate it with the title because I hadn’t read the title. Amy why does Rex go to the ACPT if he doesn’t compete? I’m sure its not to see WS in person. I already asked Rex but he never replies anymore to comments made on his blog. Just wondering. Michael didn’t attend this year, actually. He was one of many people we missed seeing. The WORMS in the centre of the grid was a nice, if not entirely intentional touch! I enjoyed the CHE puzzle, though I needed Pannonica’s explanation to understand how it all fit together. And even then, I’m still unsure about one clue. 24A is “Numbers of old?”, and the answer is ETHERS. Huh? I’d be most grateful if someone could explain this to me. I did look online to see whether there was a definition of ETHER that I didn’t know, but I didn’t find anything that answered my question. Ether was used to numb people, no? Ether as an anesthetic makes you numb…. so it’s a numb-er, with silent B. We’ve seen it before, but it can still escape us! Read it: “Numb-ers” as in things that numb. Ether being an old anesthetic. CANDLE: “A wicked thing?” is in “wick-ed”. These clues were originally seen in UK cryptics. The original famous clue for ANESTHETIC was “A number of people?” They were known in UK cryptic parlance as “Cryptic definitions”, and are the only area that UK cryptic clues and US clues completely merge now. Incidentally, the UK cryptic definitions are the one area (aside from straight FITB quotes) where the cryptic clue is not two-part… in other words there is no one section of the clue that is the straight definition. One more: “Brandy balls?”for BACCHANALIAS (from a London Times Championship xword reprinted in Games Tourney puzzles back in the 80s). Cryptic definitions are definitely way more common in U.S. puzzles today (even Monday ones)… which is a good thing IMO. … but not in US cryptics. I dreamed of becoming a gefilte fisherman but now raise turducken.